Sleep refused to come. It’s possible that it was because of the evening visit to wish my friends Eid Mubarak, a blessed holiday, as they finished 30 days of Ramadan fasting. A short visit, with “simple” hospitality– which meant only two cups of coffee, a cup of tea, a glass of soda, and sugary holiday cookies known as ma’amoul. I shifted pillows, counted out deep inhales and exhales, listened to the 4:30 a.m. call to prayer sound from the neighborhood mosque. And then I wondered if my restlessness was because of you. You, the friend from home, whose deep struggle I heard about just before bed. You, the family I recently met, striving to make life work with newly adopted daughters, separated from them by heart-sickening delays. You, Palestine… and you, Israel. You, Iraq and you, Syria. You, ISIS. You, politicians. You, Hamas. You, reporters and re-posters and you, you who haven’t watched or heard or read the news in recent weeks. Me, sharing these words to you, and running the risk of adding noise without insight. I don’t know where your situation is going, but I’m going to risk it for this reason: I think I know a place to start. A friend of mine wrote a book called “The Power of Mentoring.” He retells the story of the prophet Elijah, tracing his history backwards. On Mt. Carmel, fire fell and a multitude saw God’s power demonstrated. Before that, however, Elijah camped by a brook alone during a desolate time, with birds delivering him meals twice each day. Next he invited one woman– a widow about to starve– to join him in trusting God for daily bread, and later for life to be restored to her dead child. He went to Carmel AFTER faith had grown in those quiet places. I visited a fifty-person fellowship earlier in the month. This anonymous congregation, ten years ago, had noticed local needs and decided to live out His love. They asked. They visited. They brought aid. When war came close to them, they were on one of the main escape routes through which people fled suffering. The fellowship kept asking, visiting… loving. Today, this small congregation has served thousands of displaced, and local, families. They receive grants from organizations as varied as Samaritan’s Purse and the European Union. They are consulted by governments and other-faith groups, because they were loving the region before the eyes of the world were on them. They started by loving those in front of them. In the upheavals of this time, when I think of you and can’t sleep– broken people, beloved people– I pray that love abounds for you. I pray it rescues you from the destructiveness and darkness that plague us, and ushers you into light. And I pray today that we are saved from the allure of delay, and the inoculation that comes from information laced with disengagement. Love the people who are in front of you. The ones close are often hardest, and acknowledgment may not be present. Love strongly anyway. Love daily, without waiting for a crisis to prompt your action. Love widely, keep your heart soft when you watch the news or receive the updates. I don’t know where it will go from there… but let’s begin. Rest comes with surrender. I fell asleep as dawn broke, accepting the fact that I am unwilling to wait until I know its end before I begin the story. The chicken brought tears to my eyes. A sister in the family, the one who had cooked the feast in front of us, held up her nine-month-old baby boy. “He has never seen his homeland,” she said. The floor mats, on which we sat, were printed with the letters “UNHCR”– the UN Refugee Agency. The family fled to this city to find some respite from the war, but here they are not permitted to work, struggle to get their kids in schools, and strive each month to pay unfair, high rental costs. And as the sun set, its soft shades visible from the second-story landing we visited, they spread out a sumptuous meal to honor their guests. Chicken, tabbouleh, soup, rice. All prepared with exquisite culinary expertise and offered with hospitable hearts, constant guideposts amidst the crises of war, poverty, and grief. May you hear the whisper of God’s Fatherly voice guiding you to hold on to the spirit of fellowship and the oneness of our family of faith. May God bless you with discomfort at easy answers, half-truths and superficial relationships, so that you will live deeply and from the heart. May God bless you with anger at injustice, oppression and the exploitation of people, so that you will work for justice, freedom and peace. May God bless you with just enough foolishness to believe that you can make a difference in the world, so that you will do those things that others say cannot be done. And, May you know the love, joy and freedom that is your inheritance as the children of the Living God. Amen. Community of the displaced, outside town. 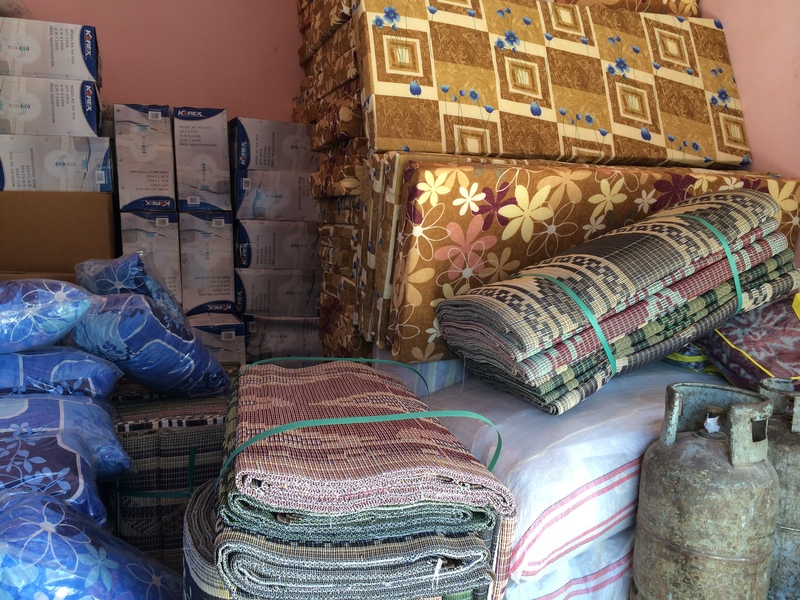 A local pastor fills a truck with small stoves, blankets, mattresses, other relief items…. and a handful of foreign guests. We leave supplies at a few apartments– some decent, some dark. We bring other supplies to tents on the outskirts, tasting the same dust that blows into the faces of those who live there. Then we stop at a pile of concrete walls with a roof. It may be a house someday, but for now its floor is rubble, its windows and doors empty holes. A dusty, broken couch, floor mats, a woman, and five children occupy one room. A mother of seven lives in the other. The second woman is on our distribution list for the day. Her oldest, a ten-year-old boy, silently helps carry “welcome kit” items to the room where his family sleeps. Their neighbor was not on the list for today, but when we start unloading supplies for her too, the boy helps– he is bigger, after all, than the oldest of her five children. “Welcome Kit” supplies for distribution to refugees. “We have only been outside the camp for two days,” the boy’s mother told me. “It was a bad situation. Much illness, very little water, very little food. I was afraid.” She is thin and tall. And she is determined. “I will be renting an apartment soon,” she says. The women kiss my cheeks and we say goodbye with the blessing of this culture: “God be with you.” I climb in the back of the truck and have nothing left to say. And if, after meeting these displaced families, I am more uncomfortable, angrier at injustice, and crying more over the pain of this world, I hope I can also be a little more of a “fool”– believing, no matter how dark the night seems to be, that there is hope of bringing that light.